The Golden Chariot luxury train journey is a wonderful experience for the tourists to South India. It offers the finest facilities to make your vacation truly a memorable one in southern India. It is run by Karnataka State Tourism Development Corporation, (KSTDC) and the hospitality is provided by Mapple Group, a leading name in the industry. The train was named after the celebrated Stone Chariot in Hampi, a world legacy site, in Southern India. It has been awarded the title of "Asia's Leading Luxury Train" at World Travel Awards,2013. This magnificent train takes you to the greatest destinations of South India covering the heritage, culture and wildlife of South India, and making your journey an unforgettable and wonderful experience. The Golden Chariot Luxury Train is equipped with 19-coaches of most stylish and comfortable type in purple and golden colours. 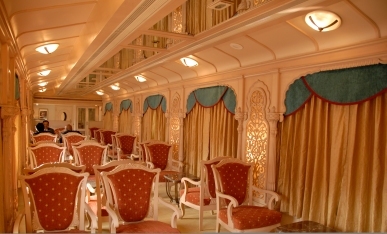 The interior designing of the various coaches of the train depict Indian design sensibilities. Each coach is named after the royal dynasties of Karnataka, such as Hoysala, Rastrakota, Chalukya, Ganga, Kadamba etc. The compartments are done up with Hoyasala style furniture giving a complete royal look, which will transport you to a glorious days of yore. In addition, the train also offers sophisticated attached wash rooms, LCD television, Wi-Fi, channel music and round the clock concierge. Other facilities included are a gym coach, ayurveda spa, and a conference coach. For dining, two dining cars with Indian and Continental delicacies are also provided. Overall, the Golden Chariot offers a unique 5-star experience on wheels with luxury and service to match. Enjoy your vacation in elegance, royalty and grandeur. The Golden Chariot houses 44 air-conditioned cabins. In these, it houses 26 twin bedded cabins, 17 double bedded cabins, and one cabin for the handicap guests. The luxury train offers two royal itineraries for your convenience. Bangalore - Kabini - Srirangapatnam - Mysore - Shravanabelagola - Belur - Halebid - Hampi - Badami - Pattadakal - Goa. Bangalore - Chennai - Pondicherry - Tanjavur - Madurai - Thiruvananthpuram - Alleppey - Kochi. For romantic couples, looking for a railway-themed wedding venue that has all the glamour and luxury of the Train Journey, there’s no better place than the The Golden Chariot. For honeymooners, this luxury train offers the privacy of comfortable Royal Coach to spend your most memorable time.